Estimates on the number Persons with Disabilities (PwDs) in India vary significantly. This is because of different criteria of definition and measurement, and also the fact that in India disability goes unreported in many cases. As per the 2011 census, there are 26.8 million PwDs in India (approx 2.4% of the population). The WHO estimates the Indian PwDs to be around 6% of the population. However, unanimity prevails that there’s a rise in health problems alongside an improvement in life expectancy. As a result, there will be a growing number of people with disabilities and they will need attention over a prolonged period. While the developed nations have taken giant strides in terms of inclusion of the disabled and accessibility, India lags behind. We need to answer two main questions. What will it take to get the relevant stakeholders to expedite affirmative action? How do we bridge the gap that’s a barrier to adding a powerful new engine to India’s growth? Enhancing the employability of PwDs is the most viable answer. 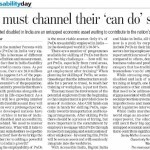 Only 3% of PwDs are gainfully employed in India — in the developed world it’s 30-50%. There are a number of programmes available for skilling of PwDs but there are two big challenges — how will we get PwDs, especially from rural areas, engaged in training? And how will they get employment after training? When planning for skilling of PwDs, we sometimes forget that the infrastructure available for a person to travel, to reach her training or workplace, is just not there. This may mean the involvement of the potential employers from the beginning so that employment is provided close to areas of residence. Also CSR funds can come in handy for skilling PwDs, especially towards transportation and housing arrangements. After skilling PwDs there should be a process of hiring, but more important is the commitment by employers to engage with PwDs through focused job mapping and sensitisation of other employees – by ensuring this, PwDs will be seen as assets and will seamlessly integrate into the workforce. With Accessible India, Digital India and Make in India, all that is required now is a push by corporate India to include PwDs in their hiring plans. Most sectors having employees with disability report attrition rate of less than 50% as compared to others, demonstrating the business value and productivity of this category that has traditionally shown a tremendous ‘can do’ attitude. While stressing employment of the disabled and lack of access to skills training at length, one has to take into cognisance other simultaneous issues that need to be addressed — the social stigma associated with disability, adverse social protection systems, labour market imperfections and inadequately structured legislative intervention. While India marches ahead on the world stage as an emerging economic superpower, the educated disabled still await their big opportunity as an untapped economic asset with the potential to contribute significantly to the GDP.